�They�ve found a rifle,� one of the searchers says, pointing to a couple kneeling in the distance. Under an unforgiving sun, along with five or six other volunteers they had been crisscrossing the field with a metal detector. Their discovery just might be the once-smoking gun that could solve one of Texas� most enduring archeological mysteries: Where was the 1813 Battle of Medina fought? Almost as puzzling as where the battle took place is why so few have ever even heard of it. As he points out in his self-published book, more than 1,000 men died in the battle or faced execution not long afterward. While the back story is complicated � a combination of events involving American filibustering and the beginning of Mexico�s revolution against Spain � the numbers are enormous. 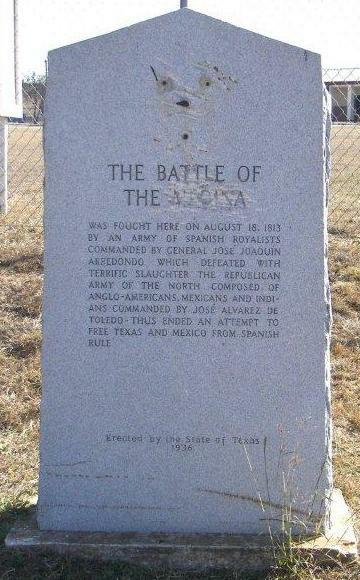 Some 4,000 Spanish royalists and 1,500 Tejanos and Americans fought a running battle on Aug. 18, 1813. More than a dozen artillery pieces loaded with solid iron projectiles or grapeshot (which converted them to giant shotguns) left the field littered with body parts. What the cannons did not do soldiers with bayonets and swords did. Arellano, a descendant of one of the participants, is spearheading the effort to pinpoint where it happened. He�s spent more than a decade researching the battle. One thing�s for sure. Despite its name, the Battle of Medina did not occur on the Media River. Most sources say the military confrontation took place �about 20 miles south of San Antonio.� But incredibly, in nearly 195 years, no one has fixed the exact site of the battle. The only comparable mystery in this state is whatever happened to the famed Twin Sisters, the two cannons that helped Sam Houston win the Battle of San Jacinto. Speaking of cannons, a cannon ball was what started things rolling in the latest search for the Battle of Medina field. In the spring of 1977, San Antonio native Edgar Ferguson, then a 31-year-old heavy equipment operator, bought 14 acres about 13 miles beyond Military Road off U.S. 281 south of the Alamo City. One striking feature of the property is a massive oak, its multiple thick trunks shading an area of at least 20 yards. Ferguson decided to locate his mobile home near the huge tree, which must be 500 to 600 years old. The Battle of Medina Centennial Marker in Losoya, Texas. Ferguson told them about having found the iron balls on his property years ago. Aware of Arellano�s efforts to locate the battle site, the couple contacted him. Arellano in turn got in touch with Ferguson, who gave him permission to conduct an archeological survey of his property. That happened May 31. After Arellano briefed the volunteers on the battle, Ferguson went to his house and returned carrying the ball he had kept all these years. About the size of a baseball, the rusty iron sphere bore pits and dents. Ferguson said it weighed about four pounds, a common projectile size for a field gun of the early 1800s. Charlie Yates of Dripping Springs, a Republic of Texas era military re-enactor who owns a six-pound cannon, says such weapons could propel a four-pound ball up to 1,700 yards. The balls traveled at a relatively low muzzle velocity of around 750 feet per second, but they could bounce around and do a lot of damage, especially to massed troops or the enemy�s cannons. Seeing that artifact whet the appetite of the assembled volunteers, a group ranging from ninth graders on hand with their history-minded geography teacher to several retirees ready to play Indiana Jones. They spent a hot half-day digging in the sand around that ancient tree. Ferguson showed them where he reburied the balls, but none turned up. Meanwhile, other volunteers walked a 10-acre field and a smaller 2-acre tract on Ferguson�s property. The husband-wife team from San Antonio found the rifle on the larger field. After photographing the visible portion of the rifle, the man who found it carefully removed the rest of the sand that covered it. Then he retrieved the rusted remnants of a child�s pump-action BB gun from the 1950s. But all those on both sides who died fighting for what they believed in cannot be honored until someone finally figures out where it happened.